Poison by Dior is one of those classics from the 80s that I don’t give a whole lot of run time to. Because I don’t like it. I tried to. I came around to Opium and eventually cultivated a reverence for Jicky, but when it comes to Poison, I am still left wondering why. I guess I just don’t like it! But I’m going to review it anyway because it is a well composed beast of a fragrance that remains one of Dior’s most popular perfumes. In Bottle: Smells sweet in the bottle, almost like cough syrup with a slight spiciness to it that layers over a faint woody presence. Extra: Whew, Poison! You sure came in loud. There’s nothing quiet or gentle about Poison. She’s big, she’s bold, her volume’s all the way up and she isn’t afraid of share what she thinks. Poison starts off with a sweet plum and blossoms mix with a spicy blast that projects like crazy. The top notes are guaranteed to clear quite a bit of distance around you and create a Cone of Smell sort of thing as the mid stage comes in with a added dollop of spice that’s coated in jasmine, rose, and heliotrope. My favorite friend, tuberose also makes an entrance here. Dragging behind it is a very irate cedar scent. Amusingly enough the cedar in Poison is the type that teeters into loud and obnoxious territory but the rest of Poison is so loud and bold that the cedar smells almost tame on me. Once the sweetness and fruitiness of the opening calm down we get into the end stage where Poison is a spunky lady that smells of incense and sophisticated florals holding onto cough syrup in one hand while she applies lipstick with the other. Extra: Poison was the original in a rather lengthy line of flankers. In addition to the original, we’ve got Poison Tendre (green), Hypnotic Poison (red), Hypnotic Poison Eau Sensuelle (also red), Midnight Poison (blue), Pure Poison (white). And that’s not including the elixirs. Clearly when Dior decided to go bold and different with the first Posion in 1985, they really hit it big. Design: Poison’s bottle is in the shape of an apple and the glass is purple. Seems to be a popular motif for perfumes here, apples and forbidden fruits and whatnot. I do like the design of Poison’s bottle, even the blatant use of the symbolism is okay with me because the bottle is beautiful, feels nice to hold and is decently easy to handle. Notes: Coriander, cinnamon, orange blossom, honey, pepper, plum, rosewood, rose, tuberose, wild berries, cistus labdanum, carnation, jasmine, heliotrope, cedar, vetiver, musk, vanilla, sandalwood, opopanax. I’m pretty sure Poison’s tendency to smell a bit like cough syrup is what’s keeping me from this fragrance. But don’t let that stop you, she’s big and brass and if you’re looking for that, definitely give her a try. 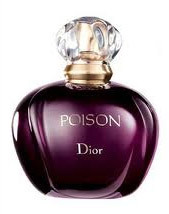 Reviewed in This Post: Poison, 2007, Eau de Parfum. This entry was posted in dior, fruity, Reviews By House, sweet, woodsy and tagged carnation, cedar, cinnamon, cistus labdanum, coriander, heliotrope, honey, jasmine, musk, opopanax, orange blossom, pepper, plum, rose, rosewood, sandalwood, tuberose, vanilla, vetiver, wild berries. Bookmark the permalink.